1. Start by preheating your oven to 425 F. Cut the top off of your head of garlic and drizzle with olive oil. Sprinkle with 1/2 tsp of Adobo Seasoning and place in the oven to bake for 40 minutes. 2. In the meantime begin preparing your cheese sauce. In a large skillet sauté your onions and garlic in 4-6 Tbs of low sodium vegetable broth. Cook until light golden brown and then begin whisking in your flour or arrowroot starch and plant milk. I add some plant milk, then the flour or starch and then while I am whisking I pour in the rest of the milk. 3. Continue whisking and cooking on medium/low heat for 2-3 minutes. Transfer the mixture to a vitamin blender and set aside. 4. Check on your garlic that is roasting in the oven. When you get close to about 25 minutes in you will want to lower the temperature to 400 F. At this point you may begin to bring your pasta water to a boil. 5. Return to your Vitamix or high speed blender and add the cashews, nutritional yeast, potato and blend on high until creamy. Taste and adjust, if you need to add about 2/4 tsp of pink salt. 6. Remove your garlic from the oven and carefully squeeze out the cloves into your blender. If you’d like you may squeeze a bit of lemon juice in as well, only about 1 tsp worth to give it a little zing. Blend on high until smooth. 7. When there is 3 minutes left in the cooking of your pasta feel free to add either peas, corn or broccoli to the water. Once cooking is complete drain all of the contents and be sure to conserve 1/4 of the pasta water (just in case). 8. 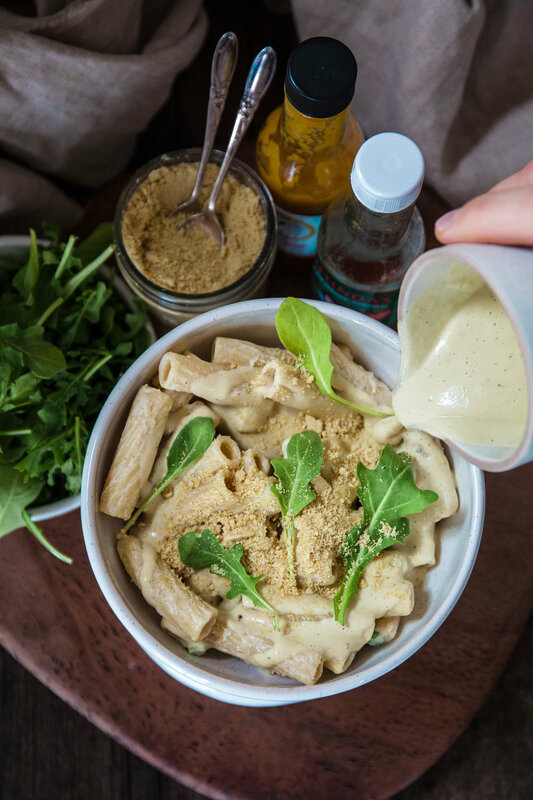 Combine the creamy, dreamy, cheesy goodness and the pasta, if you would like a thinner sauce you may stir in some of the conserved pasta water. Enjoy with Rawmesan cheese!